The yarn of Rarn and its marble fauns. 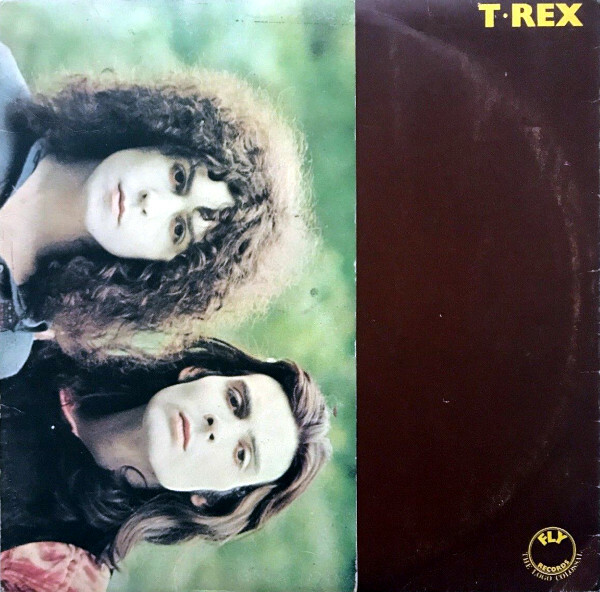 It’s on the truncated T. Rex that the balance shifts decidedly from the acoustic to the electric Bolan, never to return, and to the lament of no one except maybe one or two airy-fairy druids prancing about in modified bathrobes. This is the surfeit of sweetness that later T. Rex fans would expect, as Bolan chugs along blissfully to the febrile drums of his own imagination, spewing out nectar-nursed rhymes about spaceships, shrinking potions, wizards and elf lords. In the queerly strange musical world of T. Rex, you’re ushered in and out by the children of Rarn, and treated to a skyfull of strange constellations in between: “Diamond Meadows,” “One Inch Rock,” “Jewel,” “The Time of Love Is Now,” “Suneye,” “Beltane Walk,” “Root of Star.” Maybe not as cherished as a “Metal Guru” or “Planet Queen,” but hearing them shoots the same honey into your brain veins, though it doesn’t leave you jonesing for your next fix like Electric Warrior and The Slider do. (I credit a lot of that to Flo & Eddie, who managed to push the space madness into a higher plane of consciousness.) Listening to T. Rex, you’ll be reminded of David Bowie, and that’s no accident. Tony Visconti had just helmed the first proper Bowie album, and brought many of the same strange science-fiction sounds into the fold for Bolan’s fifth. “The Visit,” for example, could be heard as a second space odyssey, while the use of distorted guitar (“Jewel”) and strings (“Diamond Meadows”) are recently acquired accoutrements in Visconti’s (and now Bolan’s) arsenal. T. Rex isn’t a perfect record. I have no idea why “The Wizard” is almost nine minutes long, for example. And Mickey Finn as a one-man rhythm section is about two men short of a good show. It’s the irrepressible impishness of Bolan that ultimately wins the day. Hearing him glide through a song like “One Inch Rock,” you realize that, given even an inch, Bolan provides a mile of smiles in return. All titles composed by Marc Bolan. Marc Bolan (guitars, vocals, bass organ), Mickey Finn (drums, bass, vocals, pixiephone) with Howard Kaylan (backing vocals on B4), Tony Visconti (string arrangements), Mark Volman (backing vocals on B4). Produced by Tony Visconti; engineered by Roy T. Baker. Photograph by Peter Sanders. Design by Graphreaks. Released on elpee in December 1970 in the UK (Fly, HIFLY 2) and the US and Canada (Reprise, RS 6440); reached #13 on the UK charts and #188 on the US charts. Re-issued on elpee in Australia (Cube/EMI, HIFLY-2). Re-issued on elpee in 1979 in the UK (Cube, HIFLY 2). Re-released on expanded, remastered compact disc (Expanded Edition) on October 4, 2004 in Europe (A&M/Universal, 982 251-3) and on December 15, 2004 in Japan (A&M, UICY-9497) with 9 bonus tracks. Re-released on remastered elpee and compact disc (45th anniversary edition) in 2016 in the US (Rhino, R1 6440/R2 556808).